The Custom is named such because it is given it's shape by a series of cuts and can be custom-modified to create a plane of any shape you wish! 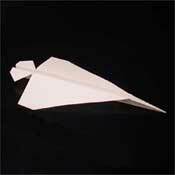 To make this paper airplane you will need a single sheet of paper and some scissors. 1. 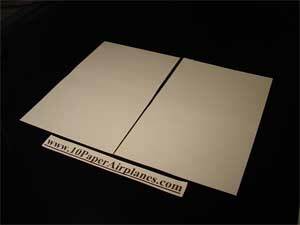 Because we will be making the shape of this paper airplane with scissors and not folds, it will not be as rigid as the others on these pages, so we will cut the paper in half along the width and use one half of a page for this plane. Fold the page in half first if you require a guide line. 2. Fold your paper in half long-ways. 3. 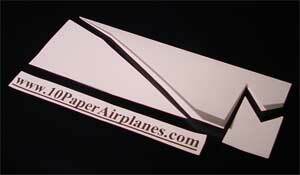 Take your scissors and visualize how you would like your own custom plane to look. Then cut the tail and wings. You can also try varying the angle of the cut near the tip to account for the body. 4. Once you've shaped your plane with the scissors, fold down the first wing and tail however you would like. 5. Make sure you fold the other wing and tail exactly as you did the first. 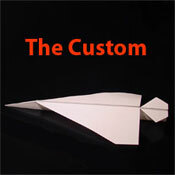 Your Custom may need some fine-tuning before it will fly perfectly straight. If your first attempt doesn't fly so well, try again! You can make some cool stunt planes using this method. If it dives, slightly angle the rear of the wings or tail up. If it climbs and crashes, slightly angle the rear of the wings or tail down.